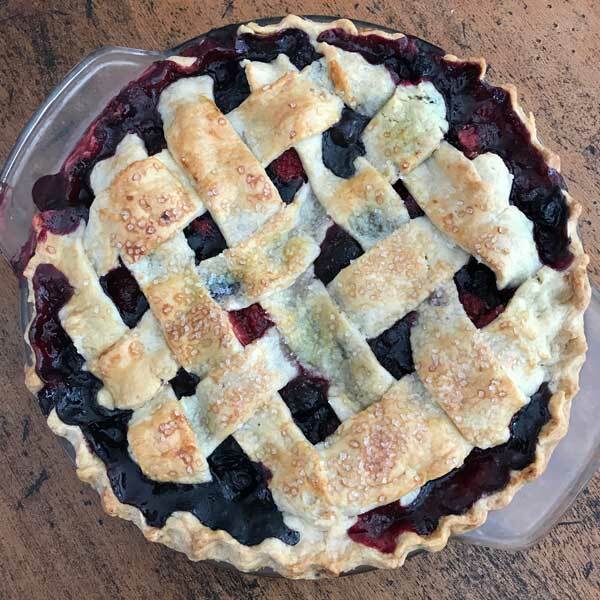 This Four Berry Pie is one I put together using three different recipes. The first was from James Villas, another was from a Chicago Tribune recipe credited to Grant Achatz’s dad, and the last was from Michele Stuart of Michele’s Pies. As per the name, Four Berry Pie calls for strawberries, blueberries, raspberries and blackberries — all of which were on sale this week at Jewel for 99 cents a pint! I wish berries were that price all year because I’ll definitely be making this again. The recipe uses ground up Minute tapioca as a thickener and it really does a good job holding holding everything together. It also calls for only 3/4 cup of sugar to almost 8 cups of berries and the sweetness level is just right. A little lemon juice livens up the flavor, and there’s no added butter or salt so this pie is practically health food! 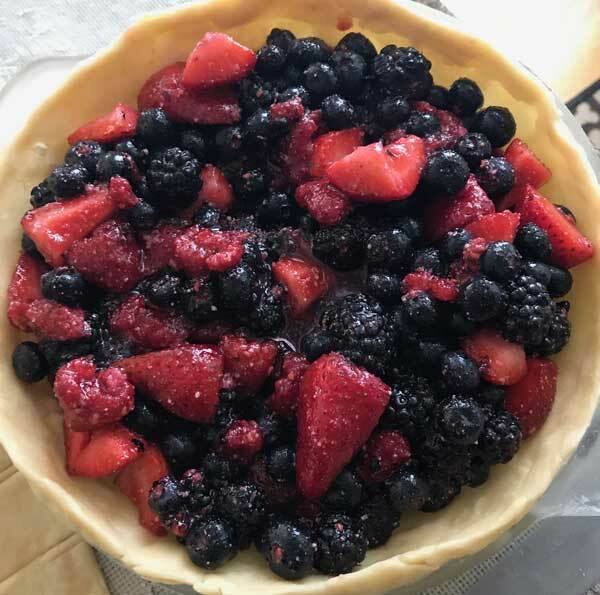 But seriously, I do feel like the berries take center stage in this pie and that the flavor is not muddled up by other things. As for the crust, this one was in two of the recipes I referenced so I went with it and will probably use it again because the proportions are easy to remember. It’s a good all-purpose dough that’s not terribly difficult to roll and bakes up relatively flaky. Of course if you don’t have time for crust, there’s always roll-and-bake! Four Berry Pie made with blueberries, raspberries, strawberries and blackberries. Pie Crust: Combine flour, salt, shortening, butter and sugar in the bowl of a food processor. Pulse mixture until coarse with pea size bits, then add water two tablespoons at a time and pulse until mixture holds together (you’’ll probably use it all). Empty onto a flat surface and shape into two disks. Wrap in plastic and chill until ready to use. Roll half the pie dough about 1/8 inch thick and line a deep dish pie dish (I used a greased 9 ½ deep dish Pyrex). Put it in the freezer for about 10 minutes or just long enough to firm-up the dough, then press plastic wrap up against it and keep it frozen for 30 minutes or up until you are ready to proceed with the recipe. Preheat to 425 (you will actually bake at 375, but it’s good to get the oven nice and hot). Also, put a heavy duty rimmed baking sheet in the oven and allow it to heat up with the oven. Preheating the baking sheet will help give you a firm bottom crust. Filling: Combine all berries in a large mixing bowl and toss with lemon juice. Mix together the sugar and tapioca, then toss with the berries. Let sit in bowl for 15 minutes while you make strips. Roll the second ball of dough into an 10x11 inch rectangle and cut 10 11 inch long strips. Put the berry mixture into the pie shell and use the strips to form a lattice. I’m not an expert at this, but the method I use is to lay 5 strips across the top, then weave 5 strips between them. Brush strips with a little beaten egg (or use heavy cream if you prefer). Set the pie on the hot baking sheet, then put it in the oven and bake for 15 minutes at 425. Reduce heat to 375 and bake for 45 minutes or until lattice is golden brown. Can’t wait to try this! 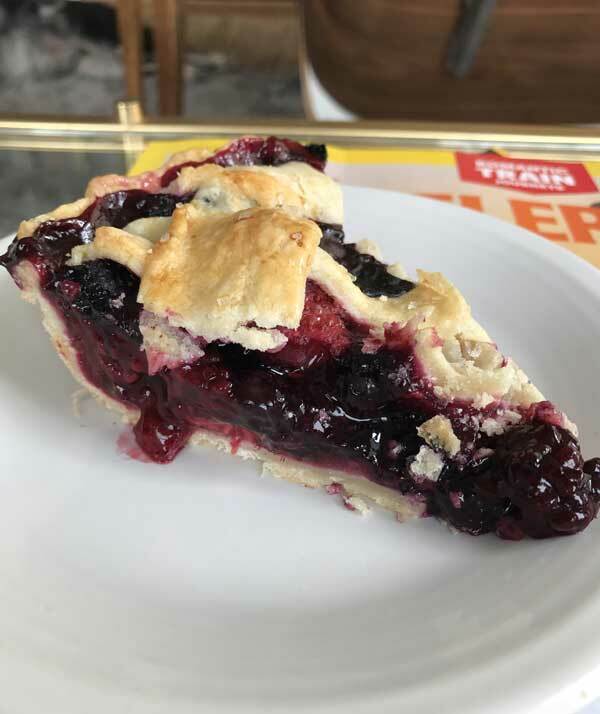 I have been looking for a good berry pie recipe. I have used tapioca in pie before but have never tried to grind it up first. I’ll have to try that and see if I notice a difference. I haven’t tried it with frozen berries,, but I plan to. For the tapioca , it is 1/4 cup out of the box. Grinding makes the filling a littl smoother, but if you skip the grinding and just let the filling stand for 15 minutes it will still be good. Hi Anna, do you think I could use frozen berries in the pie? I have tons of frozen berries in my freezer. Also, is it 1/4 cup of tapioca ground or 1/4 cup of ground tapioca? Valerie, the best way to do it is to hit print directly from my blog (the print button is right next to the recipe). It should open up a new tab in your browser with a printable version of the recipe. When I hit the print button, this is the URL I get. If you want, you can just paste it into your browser and print. You can right click your mouse or hit Ctrl-P and it should prompt the printer. Please let me know if you are still having problems. You are not the first! Is there a trick to printing the recipes in your newsletter? This is the secon time I’ve tried to print and I get a blank sheet. Mmmm, love a good healthy pie! I’ve yet to find a good GF crust that I really like. I like that my mom’s apple pie comes up as one of the related posts! They are both fine. I think tapioca gives the filling a slightly smoother texture, but cornstarch is good too. If you decide to try the tapioca, makes sure to let the fruit/tapioca/sugar mixture sit for at least 15 minutes. Tapioca versus cornstarch….which do you like better as a thickener?